Find lazy days dripping with sunshine in the tranquil Cook Islands, 15 sandy freckles in the South Pacific. There are no two ways about it, people come to the Cook Islands for the beaches: pristine ribbons, lapped by sparkling aquamarine waters. For those eager to dive straight in, the Cook Islands' best beaches are at Muri Lagoon and Titikaveka. Despite covering a vast area, the Cook Islands host a tiny population, and secluded spots are easy to come by. Some islands, such as Rarotonga (where the international airport is situated) and Aitutaki, do feature a number of developed resorts. Mountainous Rarotonga also offers plenty of verdant scenery, should you – unlikely though it sounds – grow tired of the tropical beach paradise. Situated between Samoa and French Polynesia, the inhabitants of the Cook Islands are Polynesian, with a proud and interesting culture. Calling themselves the Cook Island Maori, they trace their roots on the southern islands back a millennium to Tahiti and the Marquesas, while Samoans and Togans are responsible for settling the northern islands. The Cook Islanders also hold the tradition that New Zealand Maori migrations originated from their islands. Named after Captain James Cook, who came here in 1770, the Cook Islands didn't come under British control until 1888. In 1965, the inhabitants chose self-government in free association with New Zealand, which had assumed administrative control over the islands at the turn of the century. Apart from the interesting culture, it's the natural beauty of the Cook Islands that most captivates visitors. The islands are both volcanic and 'near atolls', which is to say land that's mostly lagoon and edged by islets. You'll find Rarotonga teeming with jungle, while Aitutake is the most photogenic island – a true paradise. Expect powdery sand, an abundance of tropical fruits, palm trees and no worries. 237 sq km (91.5 sq miles). Self-governing territory in free association with New Zealand. New Zealand retains responsibility for external affairs. HM Queen Elizabeth II since 1952, represented locally by Queen's Representative Tom Marsters since 2013. Prime Minister Henry Puna since 2010. 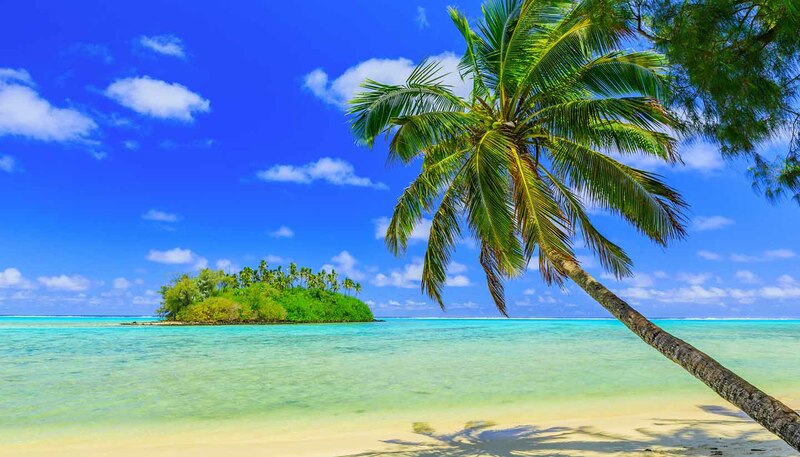 The Cook Islands are about as far as you can get from the trouble spots of the world, and indiscriminate international terrorist attacks are highly unlikely here.